Subway Surfers doesn’t look to be coming to Windows Phone anytime soon (the teaser image was just a hoax), but worry not. Windows Phone 8 will soon have a 3D endless runner to its name. Speaking of names, that runner is none other than the original game that started the genre craze: Temple Run from Imangi Studios! We knew it was coming, but this is the first time we’ve actually played the port for ourselves. 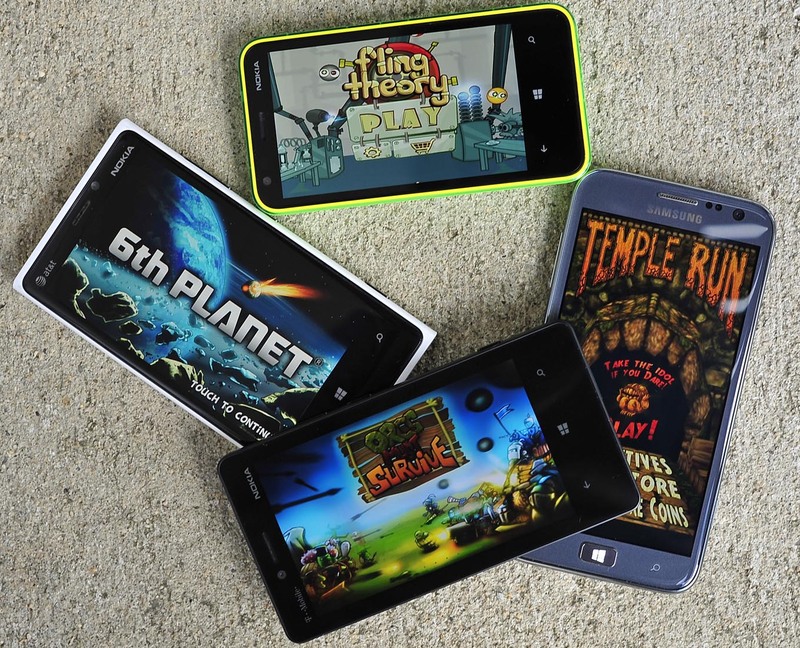 Not only that, but in celebration of GDC week, Microsoft is releasing a number of indie games for Windows Phone 8 today. Read on for actual Windows Phone screenshots, video demo and quick impressions! 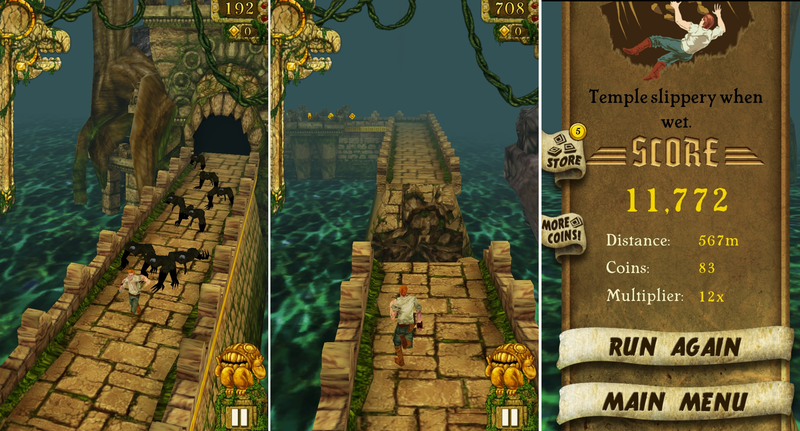 First, the bad news: Temple Run will not be an Xbox Live title. That’s right, one of the most popular mobile games around, which Microsoft specifically had a hand in bringing to Windows Phone, will not bear the coveted Xbox name. Somebody should write an editorial about that. Still, a lot of guys, gals, and people of indiscriminate gender just want to play Temple Run on their Windows Phones. They should be able to do that very soon, as the game seems to be pretty much done. The goal is to help a hapless explorer run as far through a danger-filled temple as he collects coins and dodges obstacles. The controls are simple: tilt left and right to move along the path, swipe left or right to make 90-degree turns, swipe up to jump, and swipe down to slide. If you’ve played The Gunstringer: Dead Man Running or similar games, then you already know the drill. The input here is extremely natural, surely one of the factors behind the game’s success. The Windows Phone 8 port does look a bit dated graphically – certainly no more advanced than what Windows Phone 7 can accomplish. But once the first game comes along and does well, that certainly paves the way for the sequel. We don’t have pricing info yet, but hopefully it will be free and supported by in-app purchases. This game is a unique combination of digital comic with actual gameplay interspersed between the story sequences. It plays a lot like an advanced version of Lunar Lander. 6th Planet costs 99 cents and you can get it here. “6th Planet tells the story of a near future, where the planet Saturn suddenly changes into a possible place for humans to live. To find out what is going on, a monkey is sent into space. This is the beginning of a series of events that will determine mankind’s future. The goal of the game is to guide your space pod to the landing site on the other side of the level. With only two buttons to work with, it is a simple concept that’s easy to pick up, but hard to master. The Story Mode contains 50 levels, divided across 7 worlds. This stands for at least four hours of gameplay. If you succeed in finishing this mode, you unlock the Master levels, which is a collection of very challenging levels for you to try out. This mode will be updated in the future with more content. A unique game in which players help a little red creature navigate dangerous obstacles within a scientist’s lab. The graphics are cel-shaded and create a great sense of depth when seen in motion. To move the creature around, you pull it back like a slingshot. It’s a cool marriage of physics-puzzle style controls with an actual traditional game structure. Get the Windows Phone 8 version for free here.The Windows 8 version costs $2.99 - get it here. "In Fling Theory, players solve physics-based puzzles by manipulating atoms and destroying obstacles. Your weapon? Electrons! Play through hours of gravity -- and mind-bending levels. 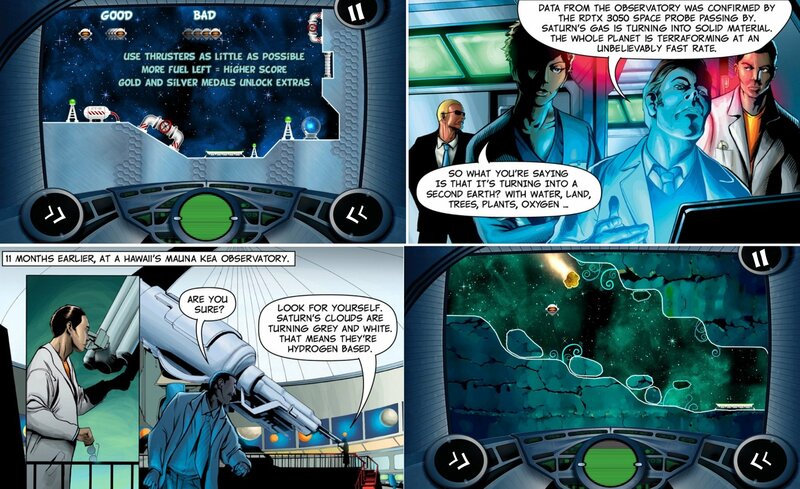 Imagine Angry Birds Space where you have to actually think about what you're doing -- that's Fling Theory in a nutshell. The game starts by giving you negative electrons and introducing the concept of repulsion. Soon we introduce the ability to manipulate the charge of atoms by hitting them, switching your polarity to launch positrons, and damaging obstacles to progress. Once those basics are taught, we ramp up the difficulty. On the fence? You can actually PLAY a demo of Fling Theory right now! Head over to http://www.flingtheory.com/playnow.html and let us know what you think! The full version contains crazier levels, over 25 of them!" A charming tower defense spin on the console and PC Orcs Must Die series. The spin is that players control the evil orcs and must fend off pesky do-gooding humans. I could do without the black borders (not present on iOS), but otherwise it's quite lovely. The Windows Phone game costs 99 cents and you can get it here. The Windows 8 version costs $2.99 - get it here. “A black-hearted King punishes the brave Orcs, the only ones in the kingdom with joy in their hearts. Join the Orcs in their battle against the royal troops to regain the happiness that was stolen by the King’s evil spell. A strategy game that brings to life the strength of these fantastic characters from the medieval era. Advance through the various levels, gaining more troops and weapons to fight the knights, wizards and ghosts of the King. Another physics-puzzle-ish game in which you launch a guy out of a catapult. Then you’ll have to help him land safely by opening his parachute in time. I’m not digging the controls in this one, but I still need to play it more. Propel Man costs 99 cents and you can get it here. "PROPEL MAN LOVES TO FLY, COME JOIN THE FUN! Use the Catapult to dispatch the Propel Man to dizzy heights in the sky and cross each level by landing safely past the finish line by deploying your parachute. Shop with several upgrades like Laser gun, Rocket Boosters, Jet Parachutes, etc. A fun and catchy soundtrack to keep you entertained"
A Boggle-style word game with online multiplayer. Think of it as a 1- or 2-player version of Wordament. 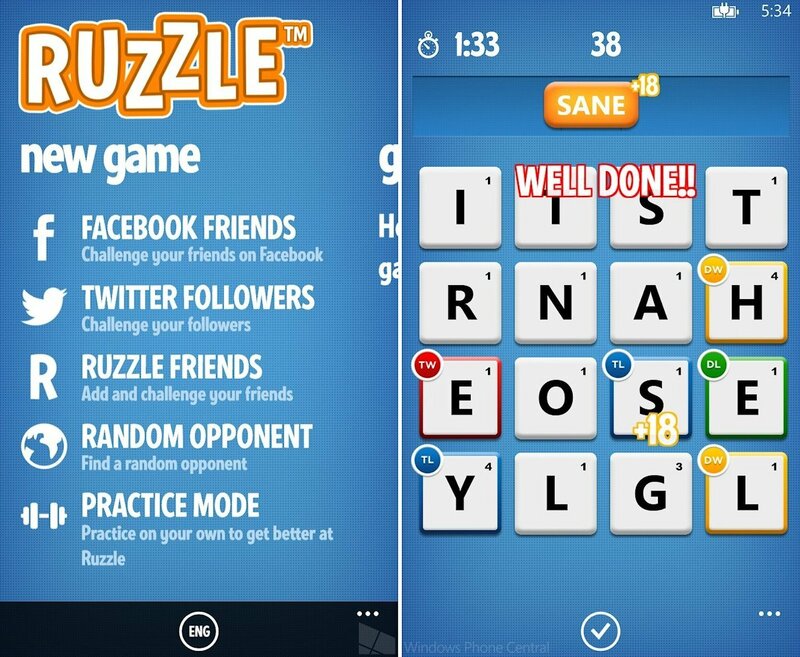 Ruzzle features Facebook integration, a single-player Practice Mode, and support for numerous languages, so it should do pretty well. It's also coming to Windows 8 - hopefully both versions can play against each other. It's listed for $2.99 and can be downloaded here. 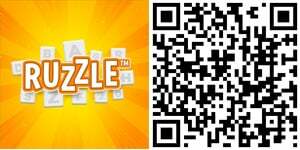 “Ruzzle is a fun and fast-paced word game where you can challenge your friends or allow an opponent to be chosen randomly. Who can find the most words in two minutes? Find as many words as possible on a board by swiping your finger across the screen. The letters may form words as long as they are connected to each other. Nice audio and animations make it even more fun to play. The matches are played in three rounds and the highest total number of scores wins. The rounds can be played when it suits you. You can get going as soon as you have two minutes to spare! Letter scores, word length and bonus pieces help you to collect as many scores as possible. Clearly Windows Phone 8’s support for Native code and multiplatform game engines like Unity is starting to allow for a lot more games to come over. In-app purchases are another feature of the new OS and will be featured in some of the games above. We don’t have release dates yet, but we’ll let you know as soon as these titles become available! Update: All but two of the games are available in the WP Store! We'll continue adding their links to this story as they come.